Having a theme always makes it easier to think of activities for your child to do at home and Easter is a theme that sparks creativity! There are so many beautiful, shiny pictures on Pinterest and Instagram of perfectly executed craft activities. There are two big frustrations when it comes to trying them out yourself: 1) Your children have different ideas and 2) You can’t get half of the items or ingredients here in Botswana! At SensoBaby, we focus on the experience of an activity, rather than the outcome. It doesn’t matter that a beautiful Easter bonnet or fluffy chick card hasn’t been produced, so long as your child has enjoyed the process and become absorbed in it. Young children are often wrongly accused of having short attention spans. This holds true in a lot of environments but when you provide materials or an activity that sparks their interest, you will see them focus on it for a lot longer. Sensory play is the most effective way to hold a child’s attention for longer; children have different preferences but there are usually one or two forms of sensory play that they will enjoy. Here’s our tried and tested top three activities for Easter Sensory Play. A resource easy to come by in most supermarkets, it’s non wasteful as the seed that has been played with can still be used, it’s relatively cheap and it’s non toxic if it accidently gets eaten! In our Baba and Mini classes this week we are presenting the seed in metal trays with scoops and plastic eggs. Our little ones have poured, filled, transported and scooped the seeds: all good fine motor activities as well as a chance to practice some cognitive planning. Running your hands through the bird seed is a surprisingly satisfying experience. The nerves on the palms of your hands are activated, it feels calming and it makes a lovely sound as it falls. Birdseed is a favourite in my house as well and it’s also a great way to talk to your children about nature, caring for other creatures and different diets. 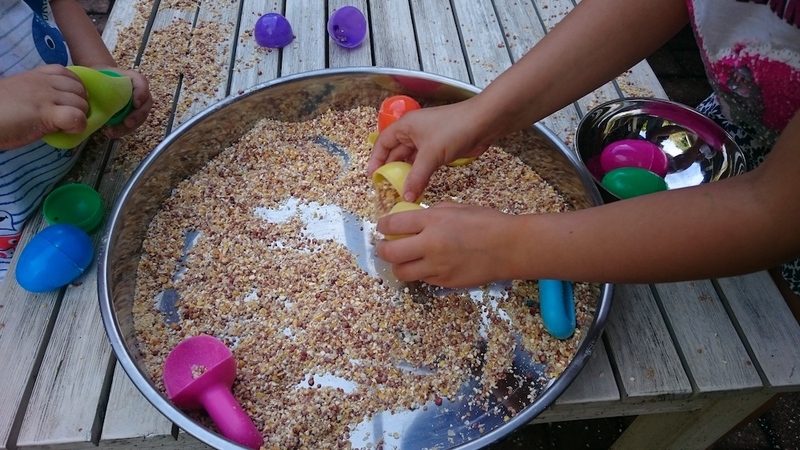 Once the sensory play is over, you can always try to make some bird feeders too. As with all sensory play, young children should be supervised. That’s painting with carrots, not painting pictures of carrots! A very simple idea but one that has been well received in our house as well as in SensoBaby. Mixing flour, water, cornflour and food colouring made a smooth, taste safe, orange paint. For older children, we just mix our regular powder paints. Using a carrot as a paintbrush, the children all made bright orange marks on the paper, tentatively at first, then with great enthusiasm. As long as they are well washed and peeled afterwards, the carrots will still be edible so no food waste! Although this may seem like a daft idea it’s reinforcing our message that art doesn’t have boundaries, you can use whatever implement you want to create art and you can look beyond the ‘rules’ of paper and paintbrushes. This all fosters creativity in children and challenges their thinking, sparking them to be more curious. Replace some of the flour for coco powder to create a divine smelling chocolate playdough. A lovely Easter gift and activity if you want to avoid giving your child the real stuff. 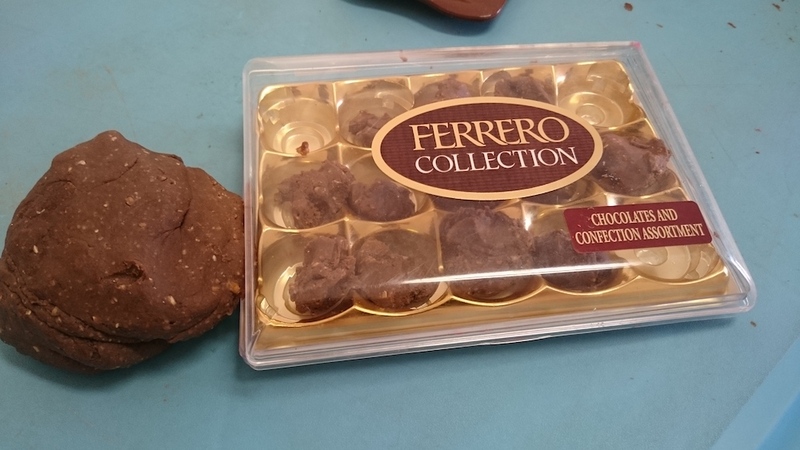 An empty chocolate box, pieces of paper they can use as wrappers and small cookie cutters can add to the fun. Create a chicken: yellow playdough with some googly eyes and pieces of pipe cleaner is an invitation to make some cute Easter chicks. We also cut up an egg box and used shredded paper to make a nest for the new creations. We hope you have fun playing with your little ones and we wish you all a wonderful Easter break! If you would like to find out more about our sensory play classes for babies and children under 5 years than check out our Facebook page, Instagram account, send us a message or email info@sensobaby.co.bw. The new term will begin in May and we can’t wait!